Shiksha Sanskriti Utthan Nyas, an organisation affiliated to the Rashtriya Swayamsevak Sangh, has set up Bharatiya Shiksha Niti Aayog (Indian Education Policy Commission), the first commission of its kind in the non-governmental sector, to study "the present education system and suggest corrective steps to make it Bharat-centric". Likely to be headed by Dinanath Batra -- who shot to fame when he pulped American scholar Wendy Doniger's book on Hinduism -- this body is being seen as RSS' effort to mount pressure on the Narendra Modi-led government to implement the Sangh agenda of "saffronisation" of education and to prevent the latter from diverting from its core ideals. Though the commission was formed a few months ahead of the swearing-in of the Modi government on May 26 -- Sangh mouthpiece Organiser informs the 'bhoomi pujan' of the office was done in Delhi on April 13 -- RSS gave its go-ahead for the panel at a recent Akhil Bharatiya Karyakari Mandal meeting in Madhya Pradesh. 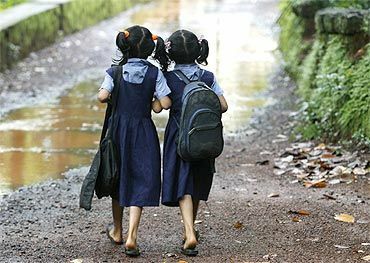 According to Sangh insiders, education is a key area in the RSS' scheme of things and could emerge as a point of conflict in future with the government. Given Human Resource Development (HRD) Minister Smriti Irani's lack of understanding of the Sangh Parivar's functioning, RSS is adopting a wait-and-watch policy. Irani, meanwhile, has managed to establish a good rapport with some senior RSS leaders, but a section of the organisation still has reservations about her credentials to occupy the important HRD portfolio. Besides Batra, the 21-member commission will have J S Rajput, former director of the National Council Of Educational Research And Training; Kapil Kapoor, former pro vice-chancellor of Jawaharlal Nehru University; Badrinarain Khandelwal, former director of the Central Board of Secondary Education and Atul Kothari as members. "It has not taken a final shape. We are contacting all luminaries in the field of education, irrespective of their ideology, for the cause of education. We will prepare a curriculum framework and that will be circulated and discussed widely. We will seek the country's collective wisdom," said Batra. "RSS sees in him (Batra) an ideal candidate to lead an agitation if a showdown is inevitable with the government, given the body of work he has done so far," said a Sangh leader who did not want to be named. On his assessment of the new government's performance, especially the HRD ministry's, Batra said: "She (Irani) has not spoken her heart so far. They (the ministers) are settling… It is good that Smriti Irani has declared that the ministry will set up a national commission for education, on the pattern of the Kothari Commission." Batra, 85, who has been relentlessly fighting "distortions of Indian history and culture" in the school and college text books, doesn't foresee a clash with the government in the immediate future, but he won't shy away from fighting for the cause. "Our strategy is to fight to live and win. Apnon se ladna kathin hai (it is difficult to fight with our own people). But when it's for the cause, we have to fight," Batra added. However, Atul Kothari, the secretary of the Nyas, dismissed any suggestion of a political motive behind establishment of the commission. "It is an effort to revisit the education system in India and to give shape to an alternative education policy for the country. Though many commissions were set up earlier, successive governments failed to implement their recommendations. Our commission will study the reports of all the commissions so far and come out with a report," said Kothari. On why the commission was set up at an NGO level, Kothari said: "Education is not the responsibility of the government alone. The entire society has a role to play." He added the Nyas had given the HRD minister a memorandum highlighting irregularities in various departments under the ministry and "anti-constitutional, anti-national portions" in NCERT textbooks.